Beagles with their doe like eyes and floppy ears make adorable pets. However they do have stubborn side so that is why you need our Beagle Training Advice! Being stubborn can sometimes make training your beagle a bit tricky. But don’t worry, with time and patience and our beagle training advice, you will soon have a well-trained beagle! So keep on reading – we are here to help! It is important to realize that the training is not just up to your beagle. It is also up to you! Both you and your beagle will have to put equal amounts of time into training. By both putting in the time and effort, you both will be greatly rewarded. Training your beagle will not happen overnight but it will happen! So remember, patience is the key. If you ever get frustrated, take some time out and remember the rewards you will gain by persevering! An important piece of beagle training advice is establishing your alpha leader position early on. This is where you establish that you are the leader of your pack (family). By establishing this while your beagle is young they will learn to respect you. They will also want to please you so this will make training a lot easier. You can establish this alpha leader position by always eating before your beagle and not giving your beagle attention for the first five to fifteen minutes after you arrive home. Beagles were originally bred to hunt. Therefore they have an extremely good sense of smell. Once they get a whiff of a certain scent they are off! This can cause some frustration when training as your beagle can easily lose focus. Remember this is part of your beagle’s nature, so try not to get too frustrated. Here is an important piece of beagle training advice: start with the BASIC commands first! These basic commands include ‘sit’, ‘down’, ‘stay’ and ‘heel’. If you start with these basic commands they will benefit you greatly when you get to more advanced training. Remember, your beagle will not pick up these basic commands straight away. You need to repeat them over and over until they stick to their memory. A good tip to know if your beagle has memorized a command is this: if your beagle has to stop and process the command in their head before completing it then they haven’t fully memorized it – so keep repeating the command every day until they can do it straight away. Use rewards when your beagle completes a command correctly. These can include food rewards or just giving affection. This will encourage your beagle and they will be keener to learn the commands. Exercise is another important piece of beagle training advice. Remember to walk your beagle daily. If you have a backyard that is great as your beagle can run around all day. If not, make time to go to a dog park once in a while. Exercise is important as it will stop your beagle getting bored. A bored beagle can get anxiety which can make training difficult. 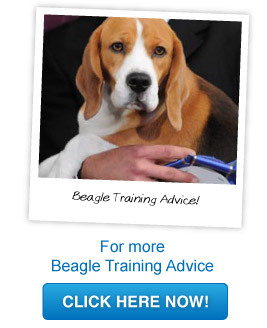 So follow our beagle training advice today. Remember, patience is so important. The rewards will be well worth it! Take these tips and start training your beagle today!